Above: Every new emoji approved in 2019. Video: Emojipedia. Above: Evolution of the emoji set 2014—2019. Images: Apple (2014—2018), Emojipedia (2019). Emojipedia composite. Unicode's announcement today indicates that all the documentation required for vendors implement the new emoji set is now complete. Links to relevant data files, technical documentation and updated charts are all linked within Unicode's post, and will be used by developers to add emoji support to operating systems, apps, and web platforms throughout 2019. Above: All 230 emojis approved for release in 2019. Image: Emojipedia Sample Image Collection. These original designs have been created in a glossy "Apple-like" style and show the range of new emojis on offer. Please feel welcome to use these images in press coverage with attribution to Emojipedia. A link back is appreciated! For enquiries about these designs, please get in touch. Shown below are are each of the new emojis approved in Emoji 12.0, minus any skin tone variations. 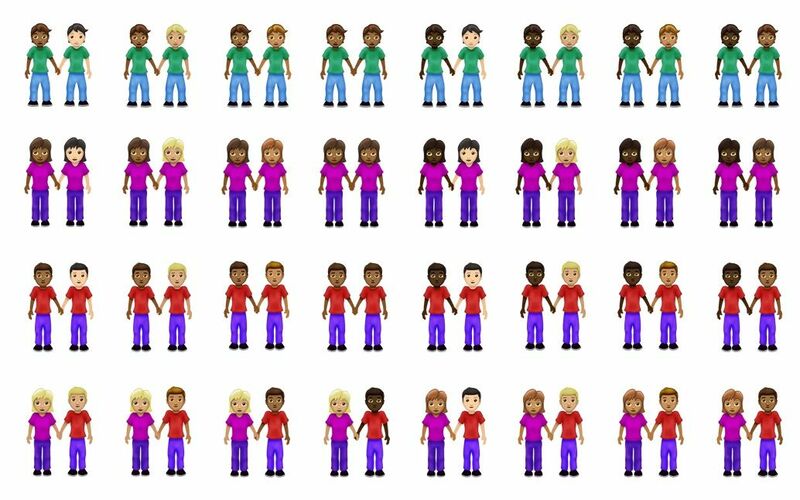 For the first time, Unicode is adding an emoji for two gender neutral / gender inclusive people holding hands in 2019, with support for different skin tones for each of the people. This can represent either those who don't identify with the existing gender options, or merely those feel their appearance or style is closer to these designs than the options for Women or Men. Technically none of these are necessarily in a romantic relationship, as the official designation is merely “people holding hands”. As with any emoji, the meaning comes down to context. One of the most frequent requests sent to Emojipedia is about the lack of an emoji or emojis to represent black families. Emoji 12.0 doesn't deliver any changes to the set of family emojis, but does for the first time, list options for all variations of people holding hands. Unicode doesn't preclude vendors from supporting skin tones on families, but the list of RGI (Recommended for General Interchange) emojis in Emoji 12.0 focuses on the 70 additions required to allow these couples to have a mix of skin tones. Facebook users already have access to families with a shared skin tone (125 combinations), and Windows users have a selection which allows a mix of any skin tone for any family member (52,000 combinations). Until now, the mix of colors available for squares, circles and hearts has varied for historical reasons. 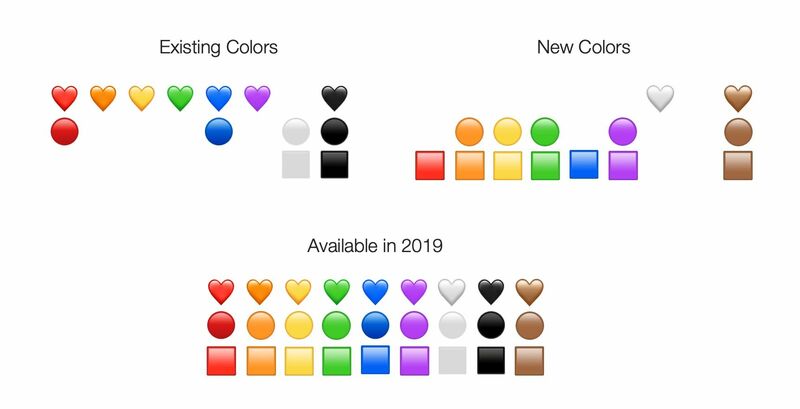 Most of the original shapes were added to the Unicode Standard for compatibility reasons; and a number of hearts have since been added (🖤 Black Heart in 2016 and 🧡 Orange Heart in 2017 (to complete the rainbow of hearts). Hearts already cover most of these colors leaving only White Heart and Brown Heart to be added. White Heart remains one of Emojipedia's most popular requests, with many people using the non-emoji character ♡ White Heart Suit in its place. Above: New colored shapes in Emoji 12.0. Image: Apple and Emojipedia / Emojipedia composite. These new colors open the door for ASCII art on steroids. They could also pave the way for custom emoji colors, if used within ZWJ Sequences. For most users, these new emojis will come to devices in software updates throughout 2019. Those subscribing to the Windows 10 Insider "fast ring" builds gained access to a number of new emojis last year, while Emoji 12 remained in beta. A number of other designs from Google and Apple are also shown below. All are subject to change prior to final releases, but give a reasonable indication of how these might look on Android and iOS. Above: A look at how the new emojis from major vendors, coming in 2019. Images: Vendors / Emojipedia composite. The Unicode Consortium will release Unicode 12.0 on March 5, 2019. 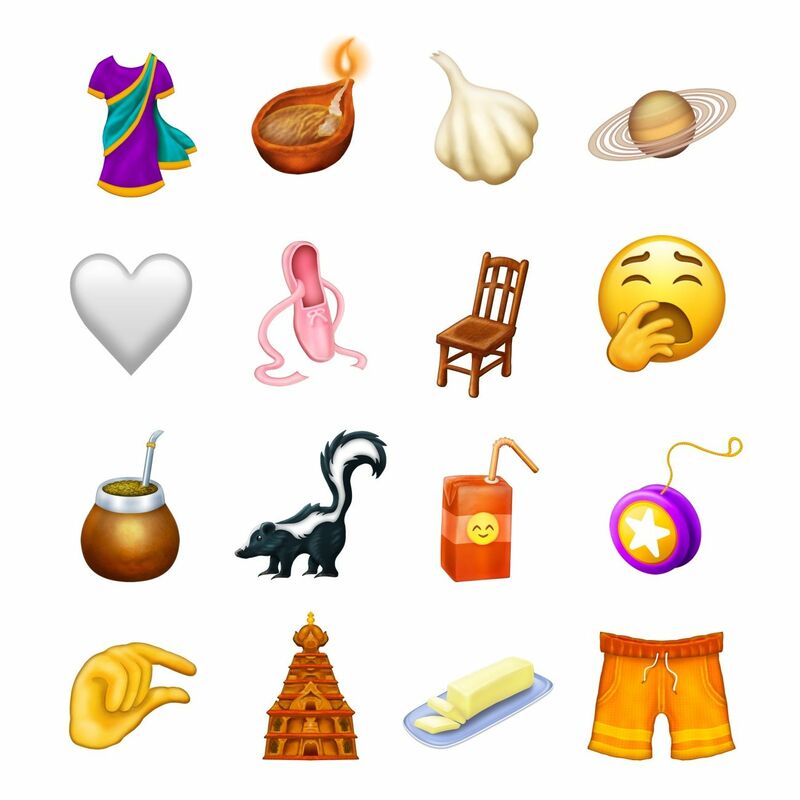 Changes to Emoji 12.0 since the last draft in October 2018 include some emoji names (One-Piece has been renamed One-Piece Swimsuit), removal of some emoji skin tone support (the last draft showed one family supporting a shared skin tone - but not the other 19 families), and the addition of the gender inclusive pair holding hands (previous versions only included women and men). Above: New in 2019: Flamingo, Sloth, Otter, Orangutan. Images: Emojipedia Sample Image Collection. 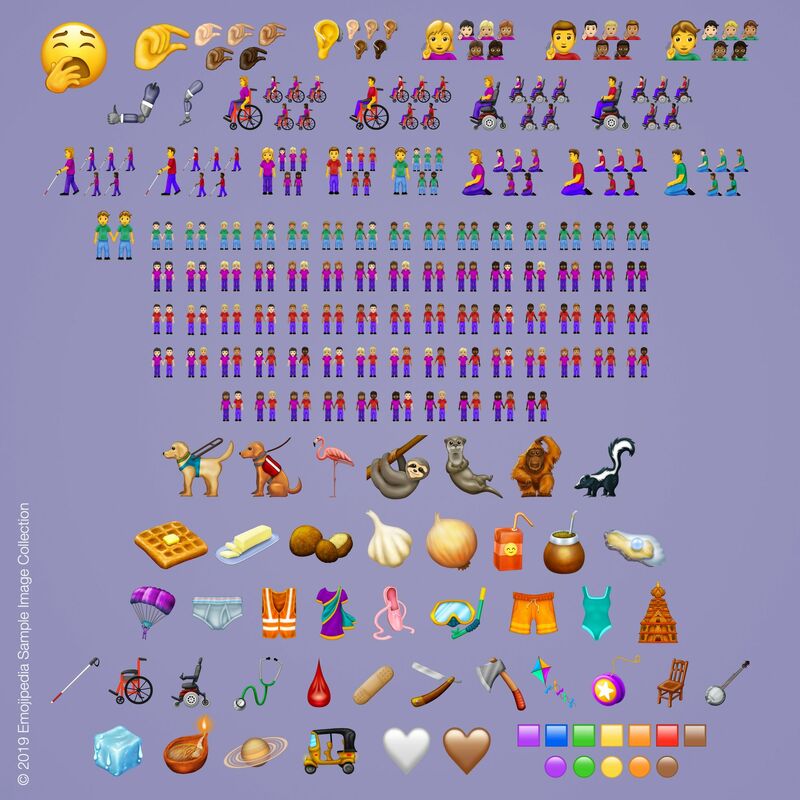 Unicode announced the publishing of Emoji 12.0 data files on 2019-02-05 (California / US Pacific Time), and noted that the announcement is ahead of the Unicode 12.0 release to give vendors time to work on their color emoji designs. Expect to see these on most major operating systems in the second half of 2019. Generally speaking, these tend to come to Android in beta around August, and to iOS in October or November. Above: A selection of new emojis coming in 2019. Image: Emojipedia Sample Image Collection. 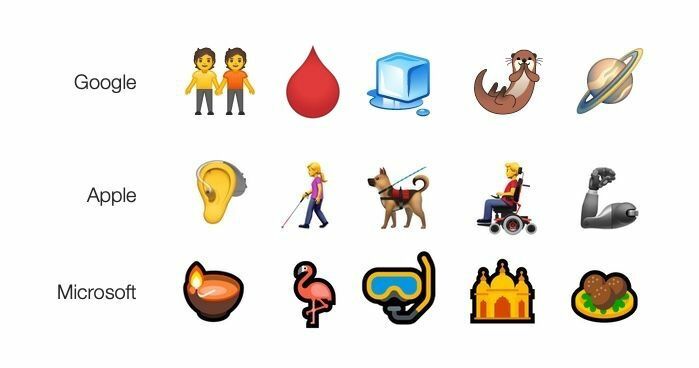 Sign up for our free, monthly email so you're first to know the latest emoji news. Emoji Wrap is published monthly, and we won't use your email for anything else.